You just got your new Android smartphone home and are ready to connect to your home network, but how do you do it? It’s pretty simple really and can be accomplished with the touch of a few buttons. 2. From there, the top option you will see under “Wireless & Networks” is Wi-Fi. 4. The device will display all of the networks in range. 6. You are now connected to a Wi-Fi network. For future usage, Android comes with a Power Control widget that can be placed on a homescreen and is a much quicker method for toggling Wi-Fi on and off. To add the widget, long-press the desired homescreen and an options menu will appear. Select “Widgets” and scroll down the list until you see “Power Control.” You have now added the Power Control widget to your homescreen. 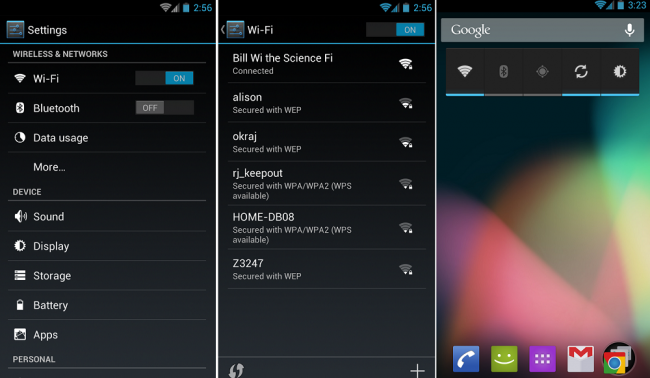 If your device is running Ice Cream Sandwich or Jelly Bean, the widgets menu can be accessed by opening your app drawer and scrolling all the way to the right or hitting “Widgets.” By hitting the Wi-Fi icon on the Power Control widget, it will toggle your Wi-Fi connection on and off without forcing you to go into the Settings menu. On some devices, the Power Control is accessible through the pulldown notification bar on the top of your display.